Dynamic employment law workflows to assist with complex legal and process decision-making. Includes guidance and links to useful information and tools. Guides you step-by-step through processes to help you comply with the law. Provides an interactive flowchart setting out the steps in each process. Offers guidance on each step, along with links to customizable templates, FAQs, training materials and more. Use this workflow to investigate a claim or report of sexual harassment in the workplace. Use this workflow to determine how to address an employee's poor performance. Use this workflow to determine whether progressive discipline should be implemented by the employer and if so, how to navigate through the progressive disciplinary process effectively. Use this workflow to properly choose the appropriate employees to be included in a reduction in force, and to navigate through the requirements of the Worker Adjustment and Retraining Notification (WARN) Act without creating further exposure for the employer. Use this workflow to handle a request for a religious accommodation. Use this workflow to determine how to respond to a union's petition to unionize a group of employees in the workplace. Use this workflow to determine whether a non-union employee's activity, including speech or organizational activities, is protected under the National Labor Relations Act (NLRA). Use this workflow to properly recoup overpaid wages from an employee. Use this workflow to determine what steps to take when a qualifying event occurs under the Consolidated Omnibus Budget Reconciliation Act (COBRA). Use this workflow to determine which entity is responsible for complying with Internal Revenue Code (IRC) Section 6055 and Section 6056 reporting requirements. Use this workflow to determine how to properly pay final wages to an employee whose employment has ended, either in accordance with or in the absence of a state final pay law. Use this workflow to determine if an employer will owe a "shared responsibility" penalty under the Affordable Care Act (ACA). Use this workflow to navigate the process of hiring an independent contractor. Enhanced to improve the comprehensiveness, organization and scope. Use this workflow to create an onboarding program for new employees. Updated to include information on the Form I-9 with a revision date 7/17/17 N.
Use this workflow to determine whether the time that a nonexempt employee spends traveling counts as "hours worked" under the Fair Labor Standards Act (FLSA). Use this workflow to determine whether the time that a nonexempt employee spends waiting, on call, on a meal break or on a rest break counts as "hours worked" under the Fair Labor Standards Act (FLSA). Use this workflow to determine whether the time that a nonexempt employee spends attending training or meetings counts as "hours worked" under the Fair Labor Standards Act (FLSA). Use this workflow to determine whether the time that a nonexempt employee spends sleeping counts as "hours worked" under the Fair Labor Standards Act (FLSA). Use this workflow to determine if an employee is exempt or nonexempt from the minimum wage or overtime requirements of the Fair Labor Standards Act (FLSA). Use this workflow to determine how much overtime an employee is owed. 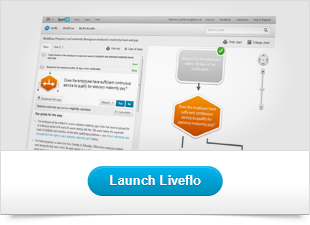 Liveflo helps to eliminate human error. I would definitely recommend it to other HR professionals when having to undertake a complex procedure.